The Applied Engineering course at St Patrick’s was developed specifically to create pathways into university courses such as these. Students benefit from having a solid practical knowledge from their Certificate II training undertaken at St Patrick’s in either Metals & Engineering or Electrotechnology, to go with their theoretical studies in Mathematics and Physics. Congratulations also to Mrs Celina Bolding for her work in coordinating and delivering this program over the past three years. Celina has moved on to the University of South Australia this year to work in the school engagement programs. Taking over from Celina in running the Applied Engineering course is Mr Andrew Costi. This entry was posted in Community Blog, Latest News on 17/01/2014 by St Patrick's Technical College. 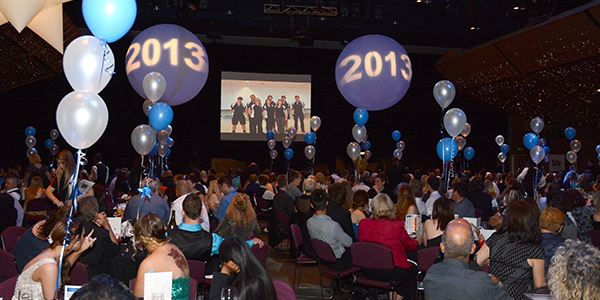 In a wonderful evening at the Adelaide Convention Centre in early December, St Patrick’s Technical College farewelled the graduating class of 2013 and congratulated those students recognised as the most outstanding in their courses. The St Patrick’s Technical College Graduation Dinner has become the most anticipated event on the College’s calendar over the past few years. With over 400 guests and almost 20 awards sponsors, the night is as spectacular as it is a celebration of the achievements of our students. A feature of the 2013 event was the Ai Group Training Services Address given by Mr Raymond Garrand, Chief Executive of the Department for Further Education, Employment, Science and Technology. A strong supporter of our College, Mr Garrand spoke of the importance of vocational training for the future prosperity of South Australia. This entry was posted in Latest News, Principal's Blog on 14/01/2014 by St Patrick's Technical College.